A DIY burlap aisle runner is easier to make then you might think. I whipped up this beauty for my daughter’s wedding and I loved how it looked in the barn setting. Add a monogram and the couple’s name with my super simple method below. I even hunted around and figured out how to get the burlap for the cheapest price possible. Start by designing your monogram and names in the fonts that you love. Cut them out from any vinyl. I used my Silhouette for this project but a Cricut will work as well. 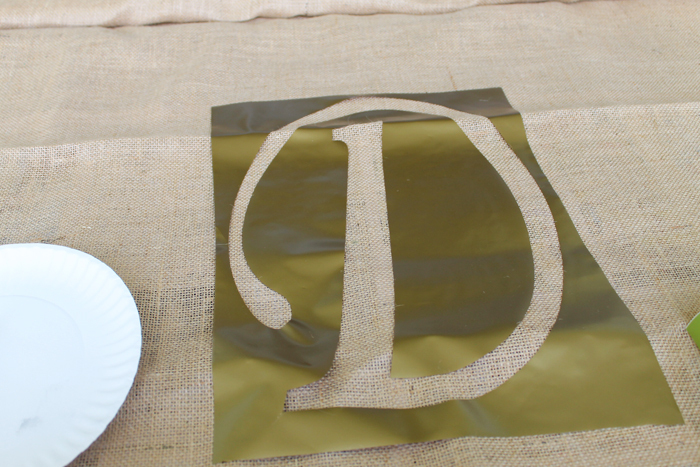 In a pinch, you can use a craft knife and some patience to cut out a stencil for this project. 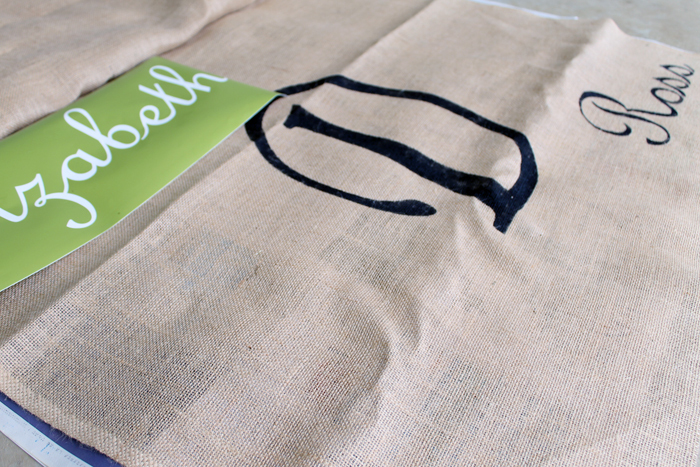 Adhere the vinyl to your burlap in the location where you would like it to go. 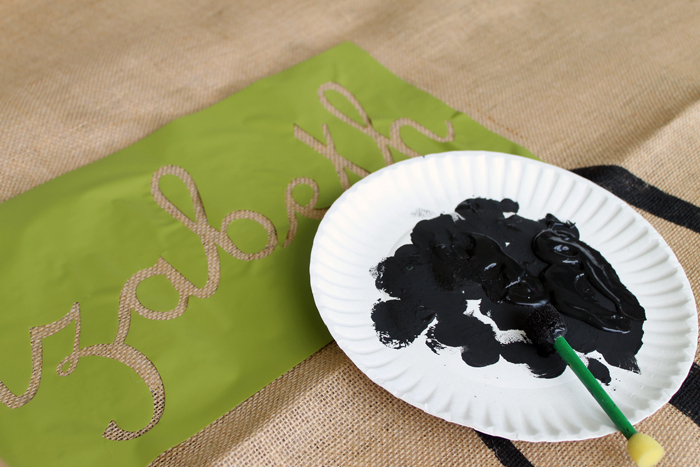 Then use black craft paint to paint inside of your stencil. Remove the vinyl after your painting has been completed. I love the pouncer brush for going straight up and down over the vinyl. This results in minimal seepage of paint under the vinyl. Continue to arrange each word on your burlap to get the look at you want. Don’t forget to protect the surface under your burlap with cardboard or newspapers. Remember the paint will seep through the burlap surface. 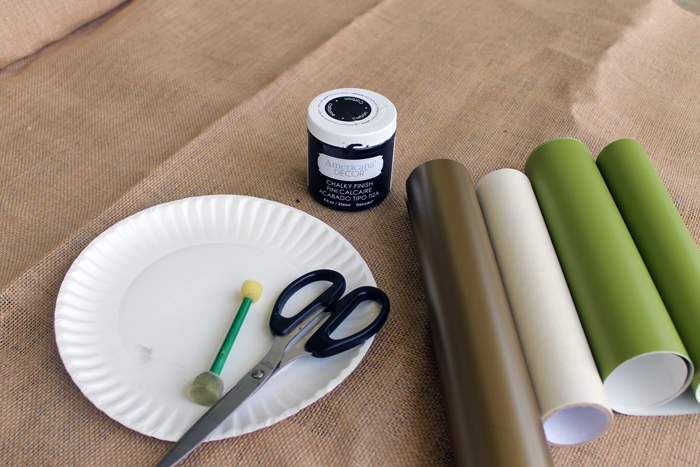 After your painting is complete, allow to dry completely before sewing multiple pieces of burlap together to create an aisle runner that is long enough for your needs. 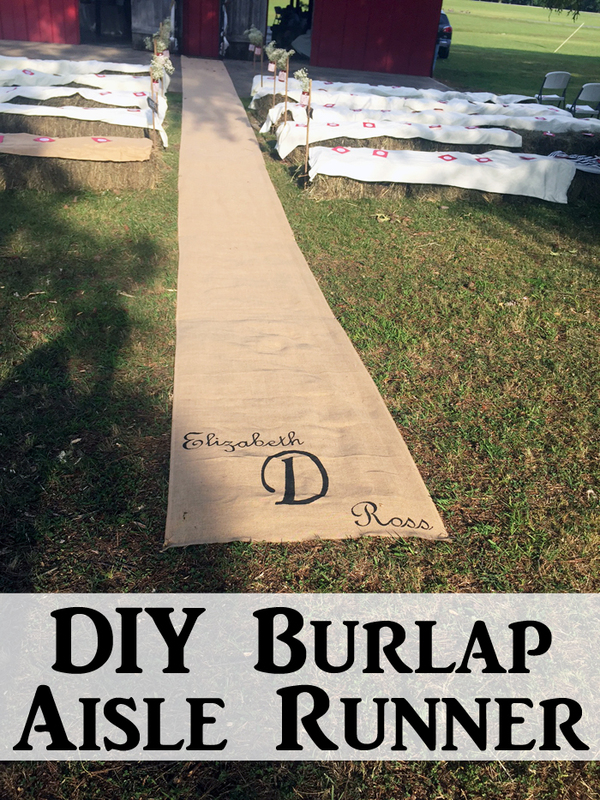 After it is complete, roll up your DIY burlap aisle runner until the big day. This will minimize wrinkles and leave you with a gorgeous finished product. We used garden anchor pins to hold the runner in place for the ceremony. Just place them every few feet through the burlap and into the ground. 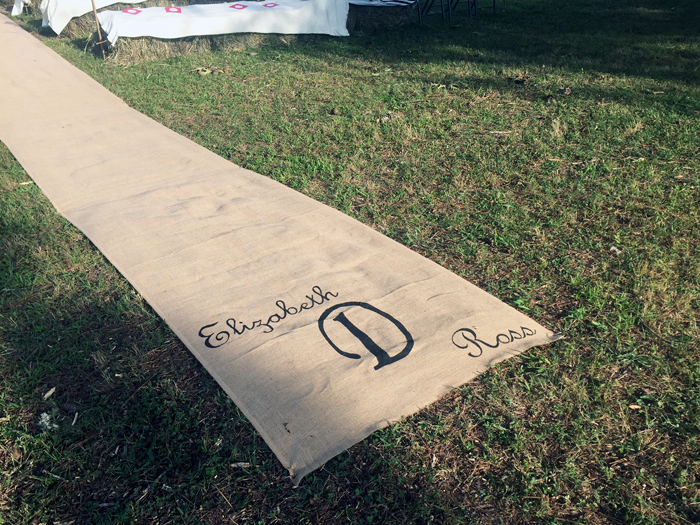 This DIY burlap aisle runner is sure to be a hit at your rustic wedding! Add this project to your DIY project list. Y’all stay tuned as the pictures of the complete wedding will be up tomorrow! 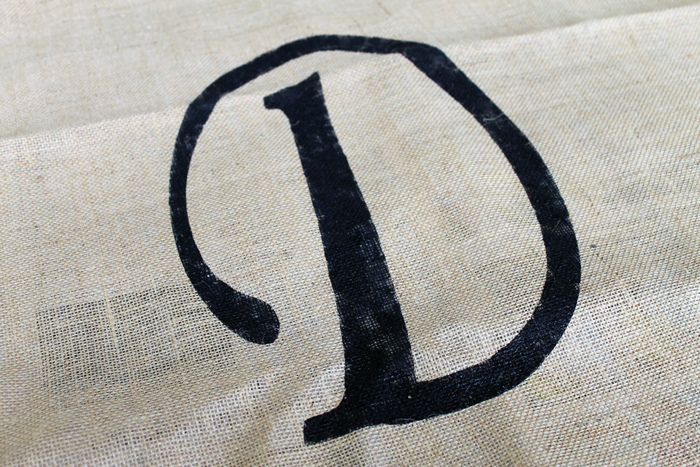 Love burlap and want more ideas? 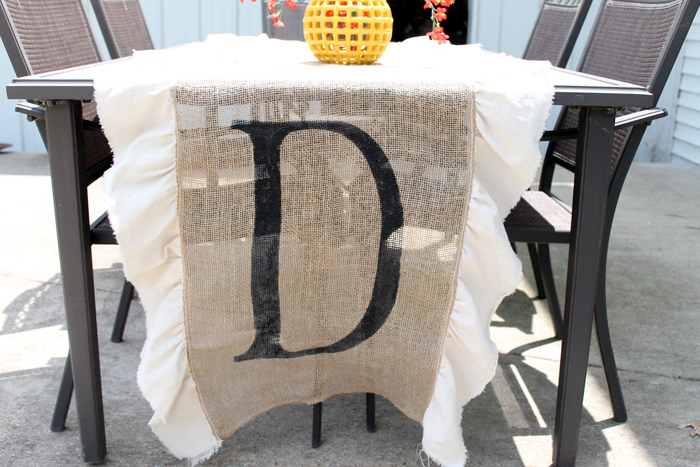 See how to make this monogrammed burlap table runner here. Want other ideas for aisle runners? Check out these ideas for 20 wedding aisle runners that you are sure to love! Hope y’all enjoyed this DIY burlap aisle runner! Be sure to add this to your wedding inspiration board on Pinterest! WOW Angie awesome runner, you sure are a handy talented Mom of Bride.. Monograms are so beautifully done. Are you exhausted yet from making wedding goodies? Do I understand correctly, daughters’ wedding will be at your farm? Can hardly wait to see photos. Was looking at burlap you got, looks like better quality burlap than buying at JoAnns or Hobby Lobby, nice clean edges so it won’t keep raveling. Might just have to get some myself for whatever needed to have on hand. Besides 40″ wide anything else specifically I should know to order? We actually did not have it on our farm. That would have been a ton of work! Yes the burlap was great. It was just on Amazon and was 40 inches wide. It was basically a bolt so the full width so both edges were finished. A really great deal actually! I kept it and will be using it for projects! i am new to Cricut.. I just purchased the Air 2 to use for my wedding projects and was already doing a burlap runner. Love this idea. My question is, how big is the “D” and the names. How do I put it on my project canvas? Anything will help. 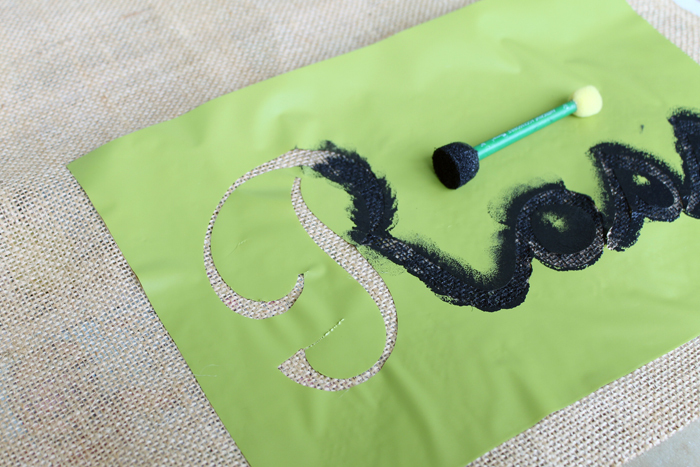 try making your monogram 12 x 24 and use the larger mat. Then cut your names separately. Hope that helps! This turned out so great! What a neat idea! What a great idea! So cute, I love the monogram on it! I’m sure your daughter loved it! I love this idea! Perfect for a country wedding! Such a great idea! Thank you for sharing at Merry Monday! Just stunning and great tutorial, looks like anyone can do this!! 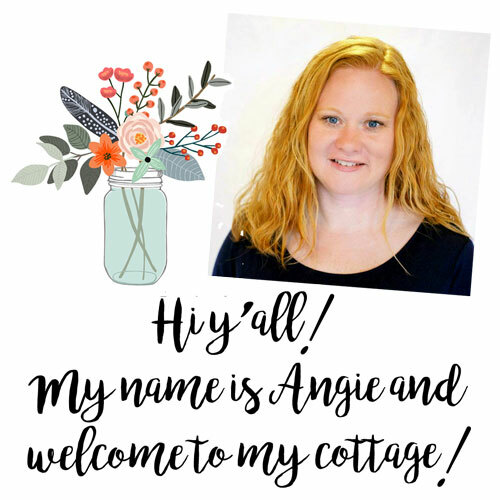 I’ve chosen your DIY Burlap Aisle Runner as my feature this week over at the Friday Favorites Linky Party, swing by and check out your feature! !